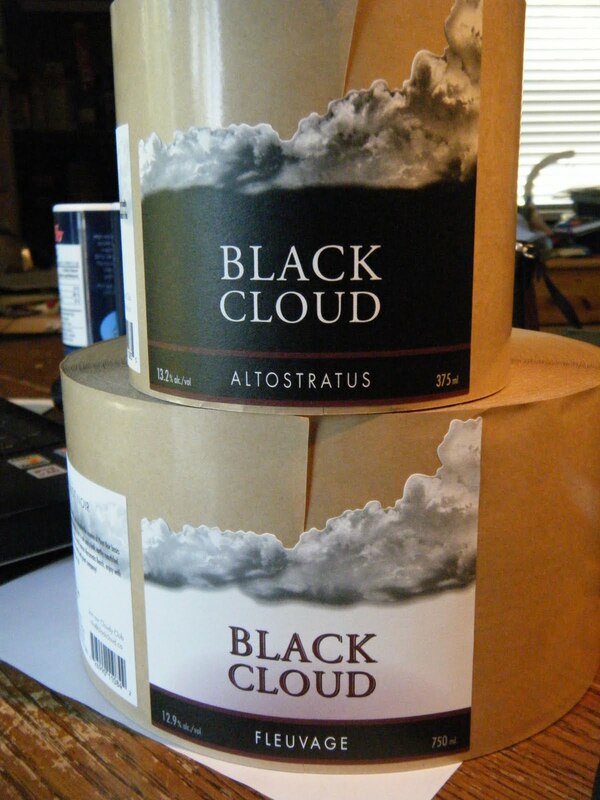 As we continue to refine the Black Cloud wine label design we get closer to what we think will work. Still not exactly what we will end up with but it's getting there. This cut-out is a bit kicked because we've been tossing it around and packing it from place to place. The actual paper stock is a more glossy silver that will give some of the cloud detail more 'light'. The words 'Pinot Noir' will have more jump as well. The colour are close, but we still won't get the true representation until it start to roll off the press. Since it's a Canadian label, we don't have to have the surgeon general's happy message. But we do have to adhere to regulations concerning English and French for certain key elements. Our final approval or checkpoint is the Canadian Food Inspection Agency which is now looking it over. They make sure all the federal regs are being met. Anne O'Grady at Magpye Productions is who we are working with to get this done. Where can I get Altostratus Pinot noir? Frank Haddad highly recommends it. or save a few dollars and have it sent to you direct. Just contact us using the CONTACT US tab.